The passage of Rochester’s CAP means it’s not a draft anymore, it’s in force. But what does that mean? How is the City going to achieve the goals of the CAP? 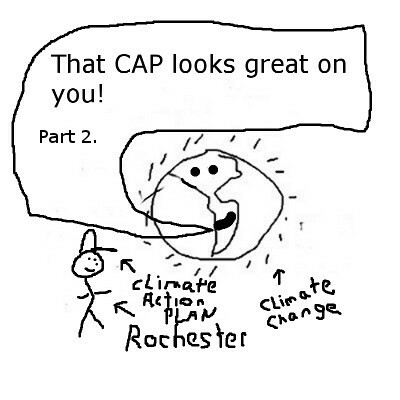 How much is Climate Change going to enter into the up-and-coming elections in Rochester now that we have a CAP? How much effort is the City going to spend on getting the findings and goals of the CAP to the public—including reaching out to neighborhoods, businesses, and the media? The passage of the CAP can stimulate a profound change in how local environmentalists approach local issues around Climate Change—climate justice, energy use and supply, transportation, waste and materials management, clean water, land use, public health, and our future priorities. The CAP isn’t a law, it’s a plan. There are many benefits for each community that has a CAP, as I wrote about in early 2016: Why Climate Action Plans (CAP) are so important for every community. Increase active transportation (walking and bicycling): This has the advantage of being a relatively inexpensive contribution to lower greenhouse gas (GHG) emissions, plus making a profound difference in the daily lives of our citizens. Reinforces the advantages of programs like those that NYSERDA offers, which assist low-income families to make their homes and businesses more energy efficient, which in turn will lessen fossil fuels use and emit less GHGs. Support the City in getting our transportation authorities—Genesee Transportation Council, Rochester Transit Authority, and the New York State Department of Transportation—to increase the safety and viability of public transportation for everyone. Robust public transit not only reduces greenhouse gas emissions (transportation accounts for a large proportion of our emissions), it is a key ingredient in addressing poverty. Connect the dots between local actions that address Climate Change and information and proposals in the CAP so that such efforts are better coordinated among stakeholders. Increase the likelihood that the media will connect the dots between the local consequences of Climate Change—more heavy precipitation, more harmful algae outbreaks in our lakes, and more incidents of West Nile Virus and Lyme disease (vector-driven diseases)—so the public becomes more aware that Climate Change is happening now and not at some nebulous point in the future. 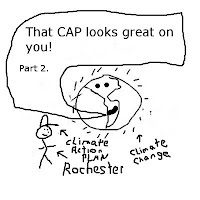 I applaud WXXI’s Connections for airing the news about the CAP’s passage and facilitating a conversation about the CAPs merits with a top City official and members of the Rochester People’s Climate Coalition. The rest of Rochester’s media ignored this news, which is very disturbing because the public is not getting this very real news that will profoundly impact their lives. The CAP validates the science behind Climate Change, informs the public about the local consequences of this crisis, and offers a plan that is tailored for our region to adapt to the unavoidable changes coming. The CAP isn’t perfect. It’s largely aspirational, and needs some way to enforce some of its recommendations as the consequences of warming in our region become more dire. None of this will happen if the public doesn’t even know this that precious document exists. The City is trying to get out the message about the CAP—tabling at local events, updating its web page on the CAP, and making sure they explore opportunities when they come up like Connections. This isn’t enough. The CAP needs extensive media coverage so we are all on the same page during this global crisis. If you and your organization have channels through which to reach a lot of local people, please consider pointing your members to the CAP and get them to read it.